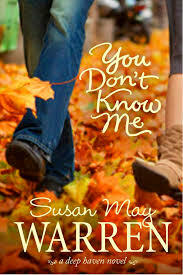 Another book in her Deep Haven series, You Don’t Know Me by Susan May Warren has an uncharacteristically darker tone. In some way, this book is better described as a romantic suspense. Annalise Decker isn’t who everyone thinks she is. A wife and mother who is involved in her community and supporting her husband’s bid for mayor, finds her world unraveling. Twenty years earlier she was Deidre O’Reilly and had fallen into bad company that resulted in her almost dying at the hands of a drug lord. To escape her own prison time she testified against him and he swore he would hunt her down and kill her. She was placed in Witness Protection in Deep Haven and had built a new life here. But that criminal is out and looking for her. Can she give it all up? Does she leave or take her family with her? Her agent, becomes Uncle Frank, and finds that this gal who he helped really is more than a job to him, she’s family and he cares more than he should, especially for her mother-in-law. Told in her characteristic style with two romances blooming at once, she add another minor character, Tucker, a boy from the wrong side of the track trying to live life the right way and running up against all kinds of obstacles as he really likes Annalise’s daughter, Colleen. Three love stories woven together make for one satisfying and well wrapped up novel. You’ll have to read it to find out what happens, but just don’t blame me if you lose any sleep over it. I haven’t read anything by her (I don’t think.) Would this be a good intro book?